LTS has been awarded a design and construction contract for a 10,000psi Pig Launcher and Receiver System from BP Production America for the Galopagos Subsea Tie back to Na Kika Platform in the Gulf of Mexico. The Contact is valued at $3.7M and includes the supply of API 6A 10M Boarding valves, API 6A 10M Metal Seated Ball and Check valves all supplied to API 6A PSL-3(G) Quality level, as well as LTS proprietary ClampTec® Closures, FlangeTec® Compact Flanges and Wireloc® Clamp Connectors. 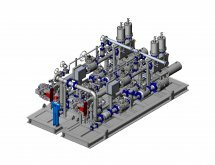 Additional contracts covering the Super Duplex 15,000psi Chemical Injection System, a 10,000psi Inteligent Pigging Skid Expansion and various Cryogenic Ball valves have been valued in excess of $1.2M.